You need a WOW! Experience? Why waste time, book Brava Events Centre Banquet Hall today. The compound is well plastered with adorning flowers that add beauty to your day. It has a very spacious parking space for your loved ones. Your guest get a first class view of all the action of the day with facilities provided such as televisions, great lighting, projector, well-structured stage, sound system, air conditioning, 24 hour power supply, tables and chairs, rest rooms. You, our most esteemed host get a comfortable private changing room with maximum security. So why contemplate? Visit us now for a golden opportunity. 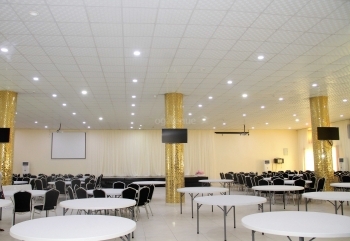 Types of events you can host at Brava Events Centre Banquet Hall are Wedding reception, Marital vows, Seminars, Religious activities, Meetings, Shareholders meetings, Trade shows, Dinners, Press conference, Networking events, Birthdays, Anniversaries, Music concert, Gala Night amongst others for 750 guests ( Banquet setting). Q: What type of chairs does Brava Events Centre Banquet Hall provide? Q: What type of tables does Brava Events Centre Banquet Hall Provide? Q: Is there parking space at Brava Events Centre Banquet Hall? Q: Does Brava Events Centre Banquet Hall provide power? Q: Does Brava Events Centre Banquet Hall have Restrooms? Q: Does Brava Events Centre Banquet Hall have Changing room? Q: Does Brava Events Centre Banquet Hall allow external Decorator? Q: Does Brava Events Centre Banquet Hall have a stage? Q: Does Brava Events Centre Banquet Hall have Chandelier? Q: Does Brava Events Centre Banquet Hall have Drappings? Q: What type of flooring does Brava Events Centre Banquet Hall have? Q: Does Brava Events Centre Banquet Hall allow you bring in your food and drink? Q: Does Brava Events Centre Banquet Hall provide security? Q: Does Brava Events Centre Banquet Hall provide projector? Sorry, not available at Brava Events Centre Banquet Hall. Kindly check out other available dates or check out other venues in Ikeja that match your requirements.